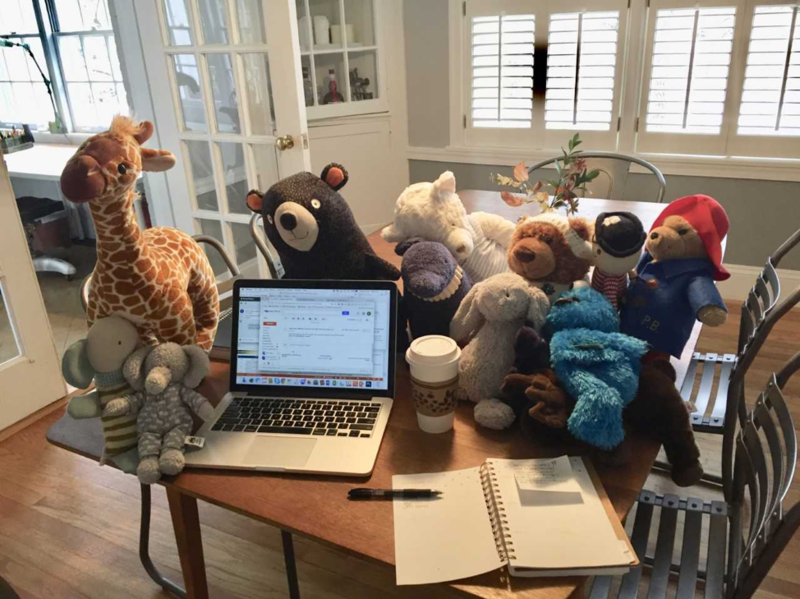 A view of Katie Jane’s desk — a glimpse into studying with a toddler. On April 9, 2018, Sen. Tammy Duckworth became the first United States senator to give birth while serving in office. In the months leading up to this occasion, she led efforts to create more parent-friendly work environment. Most notably, she garnered support for a policy change that would allow senators to bring their infant children along to vote (typically, only senators and select staff are allowed in the Senate chamber during votes). The Senate unanimously agreed to allow senators to bring their children to votes until the child reaches 1 year old. As I’ve been following the news about the changes in the Senate, I’ve been encouraged to hear that so many of Duckworth’s colleagues are supportive of creating a more parent-friendly work environment. But I also recognize that it took a lot of behind-the-scenes work to get to a place where a change-averse institution would be willing to change the rules. Women have been serving in the U.S. Senate for 86 years. How many past senators put pregnancies on hold because of their job title? How many women opted not to run for office for fear of a non-family-friendly work environment? During my time at Goizueta, I’ve been pleasantly surprised to meet many classmates who are not just working parents, but rather working parents and students. These individuals essentially pursue three full-time jobs as they juggle the responsibilities of their career, MBA program and family. In an effort to shed some light on what life is like as a working professional student parent, I interviewed a few Evening MBA classmates who fit this title — Katie Jane LaBauve, Paige Chopra, Chris Harris, Dan Miller and Huanyu Zhao. All Evening MBA students struggle with finding the hours to take care of work obligations, academic obligations and social obligations. But parents must also fit in child care responsibilities — from feeding, to arranging childcare, to simply spending quality time with their children. Katie Jane, whose son was 8 months old when she started the program, advises student parents to plan in advance. Dan has also adapted his schedule to squeeze in his many duties. This father of three, including a daughter who was born during the second year of the EvMBA program, sacrifices sleep in order to finish school work, since daylight hours are mostly dedicated to working and parenting. Pursuing an MBA is not easy. Almost all of the interviewees recommend that prospective students have honest conversations with people who might be affected by the commitment. Chris and his wife, who had a child during Chris’ second year in the program, had a conversation and agreed that school is his top priority because they see the MBA as a program that will benefit the entire family. Nevertheless, Chris still struggles knowing that sometimes he won’t be available, and his wife will need to care for their child alone. Goizueta students are ambitious and driven. They are the kind of people who struggle to accept help from others. Yet as a working professional student parent, it is necessary to let other people offer support. Most of the student parents in the program rely on their spouse and/or family to help with parenting duties while the students are focused on school. But they also seek support from Goizueta classmates, professors and program staff. The working parents expressed appreciation for professors who were willing to extend deadlines or offer alternative ways to complete courses in order to accommodate their needs. They also expressed appreciation for classmates who have been understanding when working parents have unpredictable schedules or limited options for group meeting times. Paige also appreciates that Goizueta offers flexible classes to allow students to accelerate the program. Now that she is a mother, she wants to graduate early so that she can spend time with her family. Thanks to Goizueta’s ACE courses, she has been able to accelerate her course load to make progress towards that goal. Despite the challenges of juggling parenthood, academia, and careers, Katie Jane, Huanyu, Chris, Dan, and Paige are thriving at Goizueta. They have enriched my academic experience as I’ve learned from their discipline, their time management, and their ability to be innovative and adapt in stressful circumstances. Previous story Paris International Module: Should Firms Develop Inclusive Business Models?